SKU: 7305. Categories: Shop All ThinLine Products, English Saddle Pads, English Half Pads, Hunter Jumper Tack, Dressage Equipment, Therapeutic Saddle Fitting Pads. Tags: english half pad, english saddle pad, half pad, saddle fitting pad. 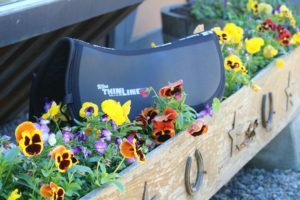 The ThinLine Trifecta Cotton Half Pad takes the basic ThinLine Half Pad to a whole new level of performance. Made with ThinLine (3/16″) over a high quality quilted cotton base pad, creating a contoured wither profile and spine free channel. This design allows the ThinLine to lay on either side of the spine so that it is always in the right place. Delivering the maximum in shock absorbency in the minimum thickness. Saddle Fitting Shims sold separately. Available in White, Black, and Dark Brown. Order English Saddle Fitting Shim Inserts for your pad: Once you place the cotton saddle pad in your cart you will see an item: Saddle fitting shims for Trifecta Cotton Half Pad. Just add shims! Machine washable! Use cold water in front loading washer. Spin to remove excess water. Hang to dry naturally with no heat source, including sun. Using a fan speeds the drying process. If you have a white Trifecta, you may use bleach products such as soft scrub on the ThinLine material as well as using a little bleach in the wash cycle. Q For the small and medium, can you tell me what the width is across the back of the pad? A Hi and thank you for your question! The measurements across the rear of the pads are as follows: Small 14.5" Medium 16"
Q I was wondering if you can place this pad under your normal pad and if it will absorb shock just as well under the normal pad? A Hi and thank you for your question! The shock absorption will be the same whether it's over or under another pad. Most riders prefer to use it over another pad in order to keep it cleaner. Also, this half pad has a generous rise at the wither and you may find that unless your base pad has a similar topline profile, the fit can be awkward if it's layered on top of the half pad. A Thank you for your question! The Ultra ThinLine panels on the pads offer many wonderful benefits, being non-slip is one. The half pads are all discipline neutral and are a great fit for both jumping and dressage saddles. The small size is perfect for 16 1/2" saddles. Q Is this pad suitable for use with a Ghost Treeless saddle? Why do you need a pad underneath? A Thank you for your question! 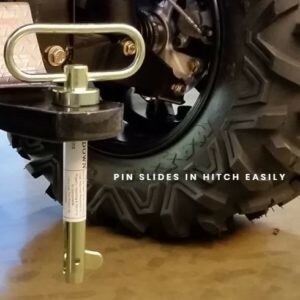 A lot of treeless riders have great success with ThinLine pads because they get the lift they need and the close contact they want. We also offer a full length Booster Shim which provides even more lift along the topline. Selecting a pad style is usually based on the measurements of your particular saddle. Most riders use a square or baby pad underneath their half pad in order to keep the half pad and the saddle clean. It isn't strictly necessary, but often the under pad is easier to throw in the wash than the half pad. In this case, the Trifecta Cotton Half pad is easy to care for and can be cleaned in the washing machine as well. A Thanks for your feedback! Please give us a call or email and we'll be happy to help! A Thanks for your question! This particular pad is designed to be used under most English saddles and on top of another pad. 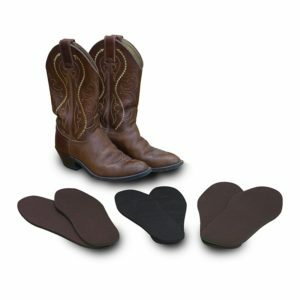 For longer, strenuous trail rides in your specific saddles, our Basic Western ThinLine pad is a great starting point. You may also want to consider one of our all-in-one pads, like the Western Color Work Pads Cordura or the Full Sheepskin Western Correction Pad. The all-in-one makes tacking up easier and eliminates the pad shifting that sometimes occurs when using two pads. We also make pads designed just for endurance saddles. Feel free to give us a call if you need further help choosing a pad!